Offering expert service in, custom marine canvas, custom upholstery, yacht interior design, bimini tops and covers, headliners, boat cushions, state room curtains, refurbishing and more. Hudson Expert Upholstery can handle the finest quality canvas work. We specialize in custom yacht interiors from the Main Salon to the Staterooms our strict quality standards and attention to detail set us apart from our competition. With our team of certified Master Upholsterers you can be assured of perfect fit and function. 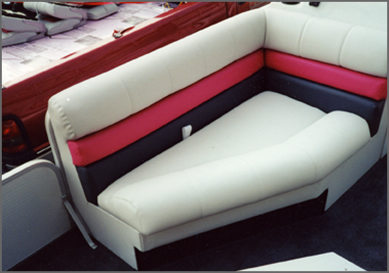 Hudson Upholstery can also rebuild the frames, housing/boxing of any upholstery related marine structure, utilizing their years of experience in custom furniture building. • Anything from a simple boat bench to state room curtains for your yacht.